To suggest additions, please contact Anne Hamland at ahamland@wvls.org. $240- 2018 Summer Reading Performer Grant contact Anne Hamland at ahamland@wvls.org. 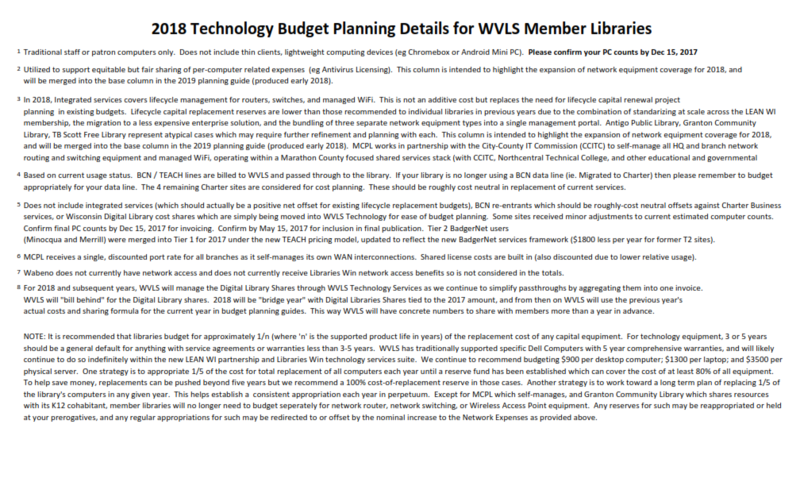 WVLS IT Services Budget Planning Guide for 2017 (with 2018 forecast). 2017 & 2018 WPLC Buying Pool with Member Shares also find your 2018 WPLC Buying Pool member shares in the WVLS Technology Planning Guide for 2018 above. Member shares are calculated based on usage and municipal population. In 2016, the WPLC Steering Committee recommended, and the WPLC Board approved an increase in the buying pool of $150,000, bringing the 2017 pool amount to $1,150,000. In 2016 and 2017 WVLS covered the cost for the new $150K addition to the pool. In 2018 and on, WVLS will be using a bill-behind model for pass-through, meaning that in any given year WVLS will be billing for the previous year’s known costs. 2018 is a jump-start year, and is based on 2017’s known numbers. The guide for 2019 will use the known numbers for 2018. There will be an increase in 2019 member shares to accomodate the $150K addition to the pool; however, the bill behind model will give libraries more than one full year to plan for the $150K addition and associated increase in their member share. 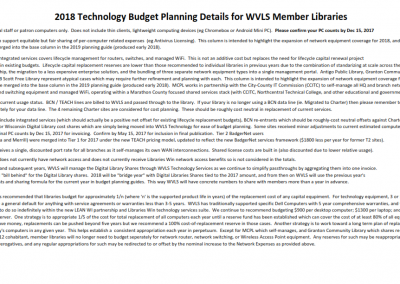 Libraries will receive a single invoice for Technology Services, which now incorporates the WPLC Buying Pool share pass-through. Please see the WPLC Board website for information, meeting agendas and documents. 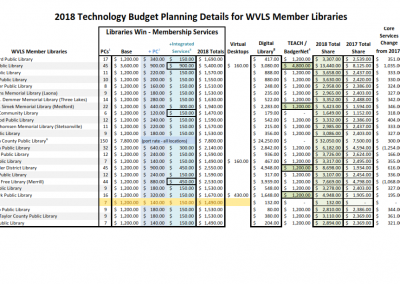 2017 V-Cat Budget with Member Shares 2017 & 2018 WPLC Buying Pool with Member Shares WVLS member library shares for OverDrive. 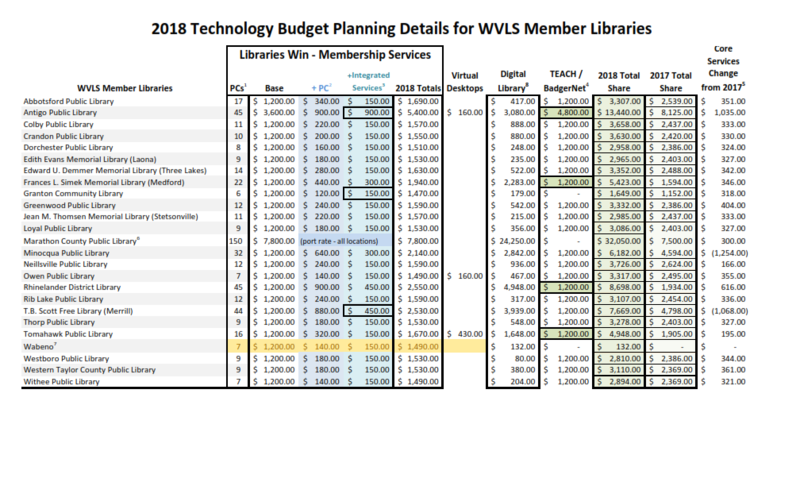 Technology planning and consultation, including budget planning, is a valuable part of your library’s Library System Membership Benefits. Please contact help@librarieswin.org with any questions related to IT services or budget planning.